Caringo recently announced SwarmNFS, and I recently had the opportunity to be briefed by Caringo’s Adrian J Herrera (VP Marketing). If you’re not familiar with Caringo, their main platform is Swarm, which “provides a platform for data protection, management, organization and search at massive scale”. You can read an overview of Swarm here, and there’s also a technical overview here. 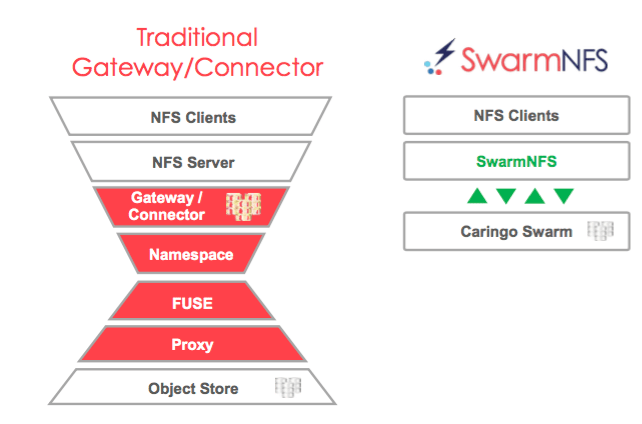 SwarmNFS is a “stateless Linux process that integrates directly with Caringo Swarm. It delivers a global namespace across NFSv4, HTTP, SCSP (Caring’s protocol), S3, and HDFS, delivering data distribution and data management at scale”. Has no single point of failure, with built-in high availability. Caringo tell me this makes it a whole lot easier to centralise, distribute and manage data, while using a bunch less resources than a traditional file gateway. You can run it as either a Linux process, an appliance or via a VM. Caringo also tell me that, since they connect directly into Swarm, there are less bottlenecks than the traditional approach using gateways, FUSE and proxies. Everything in the UI can be done via the API as well, and it has support for multi-tenancy. As I mentioned before, there’s a global namespace with “Universal Access”, meaning that files can be written, read and edited through any interface (NFSv4, SCSP/HTTP, S3, HDFS). Having been a protocol prisoner in previous roles it’s nice to think the there’s a different way to do things. Street view type image storage. One of the key things here is that, because the platform uses NFS, a lot of application re-work doesn’t necessarily need to occur to take advantage of the object storage platform. In my opinion this is a pretty cool feature of the platform, and one that should definitely see people look at SwarmNFS fairly seriously when evaluating their object storage options. Caringo are doing some really cool stuff. If you haven’t checked out FileFly before, it’s also worth a look. The capabilities of the Swarm platform are growing at a rapid place. And the storage world is becoming more object and less block and file as each day passes. Enrico‘s been telling me that for ages now, and everything I’m seeing supports that. Caringo’s approach to metadata – storing metadata with the object itself – also means you can do a bunch of cool stuff with it fairly easily, like replicating it, applying erasure coding to it, and so forth. The upshot is that now the data’s truly portable. So, if you’re object-curious but still hang out with file types, maybe SwarmNFS might be a nice compromise for everyone.